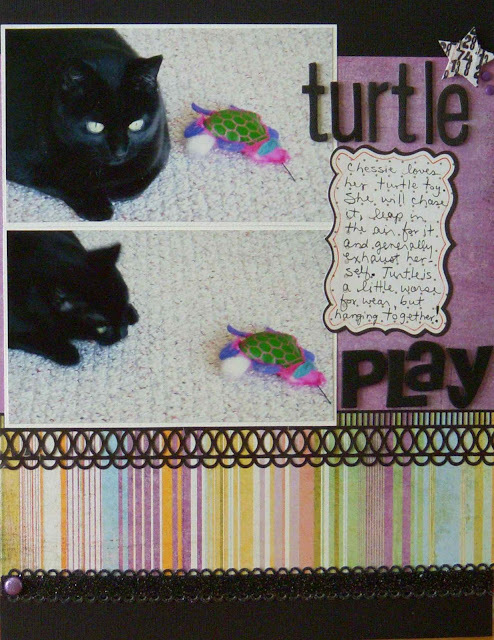 8.5 x 11 layouts using the same basic layout design, but different color schemes. 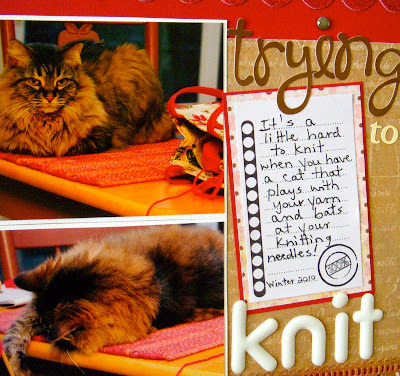 This is Lucky, who loves to be around moving yarn and knitting needles. She'll watch quietly for a bit, and then she just can't help herself and springs into action. Lucky is also a princess, can you tell by that top pose? She's beautiful and she knows it. But also a very nice cat. And then there's my black cat, Chessie, whose favorite toy is her stuffed turtle. Turtle is a little worse for the wear these days. That white material on the side is her stuffing coming out. Again, this is pretty much the exact same layout with a different color scheme. I even used my go-to striped pattern paper on each. If you own pets (or more correctly, if they own you), have you documented something special about their habits or personalities? Great LO's. They look totally different by just changing the colours and papers. Goreous photo's. I really like the way you used the same sketch and created two layouts with the different color schemes. 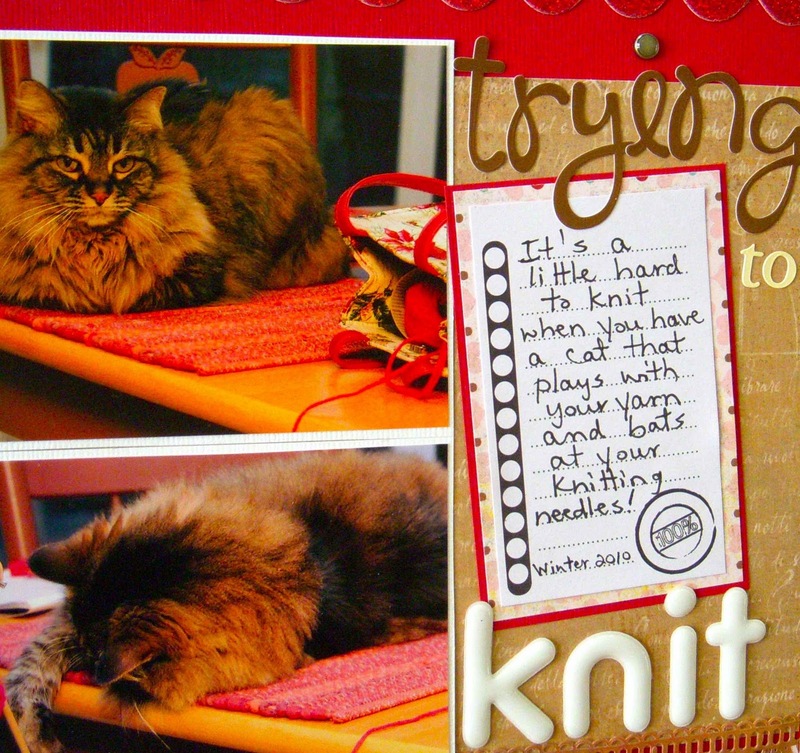 The cats are lovely and must give you lots of entertainment batting at your knitting needles and playing with Turtle. We do not have pets, however my Mama's pets are like kids to her now. 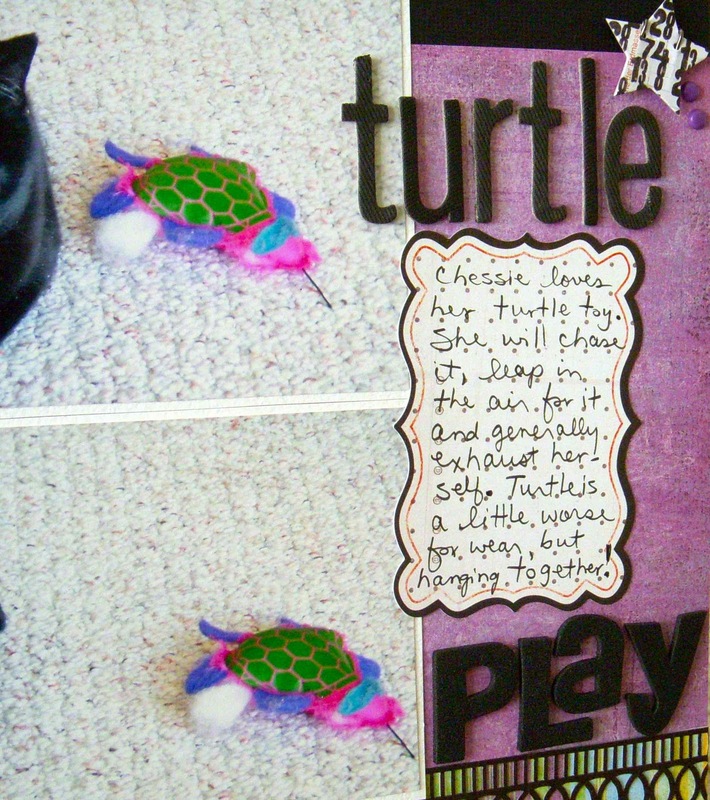 A couple of years ago when one of her dogs passed away, I created a scrapbook page in memory and framed it for her. Too cute! 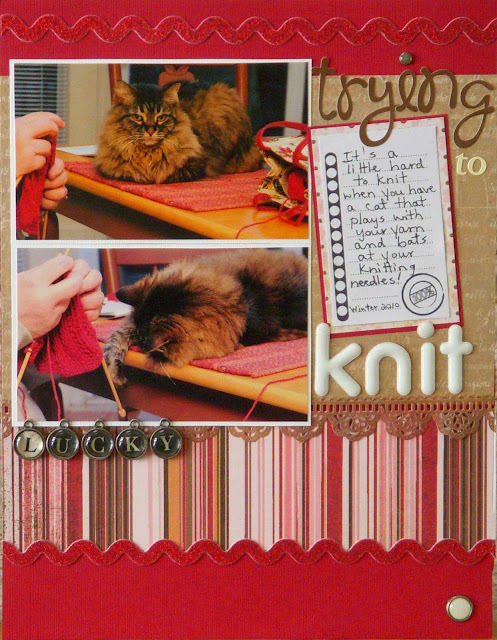 I haven't made a layout about any of my cats in quite a long time... maybe you'll inspire me to get to work on them! What cute layouts! I love that black trim on Chessie's layout! 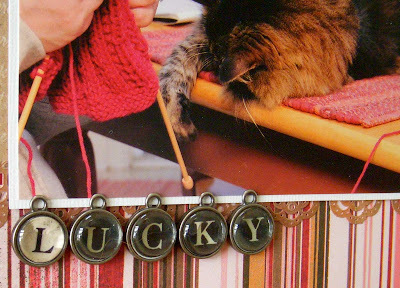 And I love what you did with the red on red with the ric rak on Lucky's! Great sketch and both layouts have a totally different look! Oh what sweet cats. Love the layouts. Great layouts! I am a fan of stripes as well! Cute cats too :) I have one cat and she hates to have her picture taken... she has quite the personality!!! Excellent layouts! I really like the charms for "lucky". Just like cats your layouts have similarities but completely different personalities! Cats just make a home so much warmer. I love pet layouts! Pets are such a huge part of our lives, like children I feel! These are great Sue! We own (my daughter's cat)Rose. But she is part of the family. I even say goodbye to her when I leave the house, teehee. I don't even realize it anymore. Such pretty kittehs!! Love the layouts! Thanks for sharing. Hehe! Such cute pet layouts! I haven't made enough layouts about my fur babies!